By Vincent Morgan	| Published on Thursday, November 26, 2009. 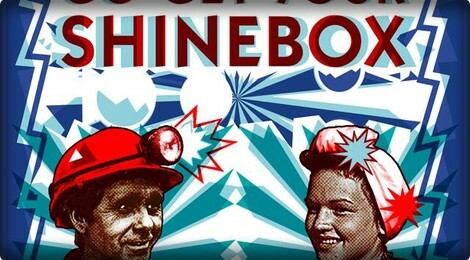 On November 21st Brooklynite Gallery will open "Go Get Your Shinebox". This group show will feature over 100 works from artists all looking to answer the question of how to survive in these economic times by creating their own interpretation of a "Survival Box." Brooklynite Gallery has commissioned some of their favorite established and emerging artist to take on this challenge and the responses are breathtaking. Artists such as Dain, Miss Bugs, PaperMonster, Anthony Lister, Ben Eine, Thundercut, Skewville, Ben Frost, Jace, Jon Burgerman, Specter, Know Hope, Kosbe, Gaia, Ben Frost, Hush, and many more have all created a one of a kind box, each taking the concept of the show one step further. You can view the entire lists of artists participating and more information by visiting Brooklynite Gallery's. A or C Subway to UTICA AVE.